A rare cause of the acute aortic syndrome, Limited Intimal Tears - also known as Class III intimal tears in the literature – have traditionally been considered undetectable by imaging. 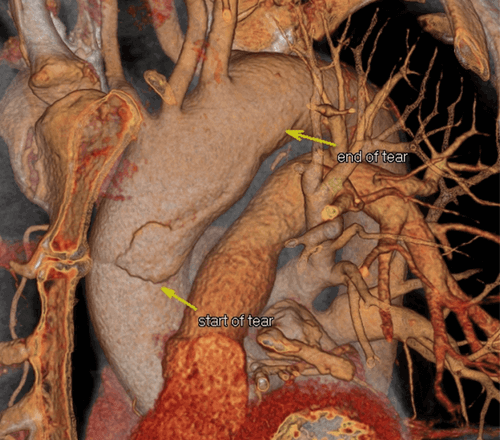 A recent article published in the Journal of the American College of Cardiology describes the CT imaging features, epidemiology, and outcomes of patients with acute limited intimal tears of the thoracic aorta (1). Dr. Chin et al. from Stanford University School of Medicine, Stanford, California retrospectively reviewed 497 patients admitted for 513 acute aortic syndrome events at Stanford between 2003 and 2012. Acute aortic syndromes were classified into classic aortic dissection, intramural hematoma, limited intimal tears, penetrating atherosclerotic ulcer, and rupturing thoracic aortic aneurysm. The authors focused on acute limited intimal tears and described prevalence, pertinent risk factors, and detailed imaging findings with surgical and pathological correlation. Furthermore, management, early outcomes, and late mortality are reported. Twenty-four limited intimal tears (4.8%) were identified (16 men and 8 women). Limited intimal tear patients were older than patients with classic aortic dissection. Ascending aortas were similarly dilated between type A limited intimal tears and type A classic aortic dissections. Eleven limited intimal tear patients underwent urgent surgical aortic replacement and 2 patients underwent endovascular repair. One limited intimal tear patient died in the hospital (4%), while in total 5 patients died after discharge with a median survival of 1.5 years. One limited intimal tear was not visible on computed tomography. The authors conclude that limited intimal tears are rare, but have similar presentation, complications, and outcomes compared with classic aortic dissection and intramural hematoma. Awareness of limited intimal tears allows pre-operative diagnosis with computed tomography angiography. 1. Anne S. Chin, Martin J. Willemink, Aya Kino, et al. Acute Limited Intimal Tears of the Thoracic Aorta. J Am Coll Cardiol. 2018 Jun 19;71(24):2773-2785. DOI: 10.1016/j.jacc.2018.03.5311.